Oh, that's a nice little typeface! I could be sold one on that! One of the pluses to having a wedge. They're not amazing machines, but they are still useful and I think fun. The reason I have all manuals now and no electrics is just that: they're electric. I want my typers to pound out my post-apocalyptic angst long after doomsday is here and gone! I am more fond of the electric typers/word processors than I first appear, however. All of my teenage angst was poured into and out of an early 90's Brother. It's at my mom's house, and I think some of my crappy poetry still lives, lurking deep within its memory banks. I would probably have the machine if it wasn't 2,000 miles away from me. But using that machine let me to a love of its predecessors, and that means a lot for one humble little Brother electric. Oh, he means well. He admitted watching this print was actually pretty cool. And you should totally go grab that Brother, it can be your one wedge. 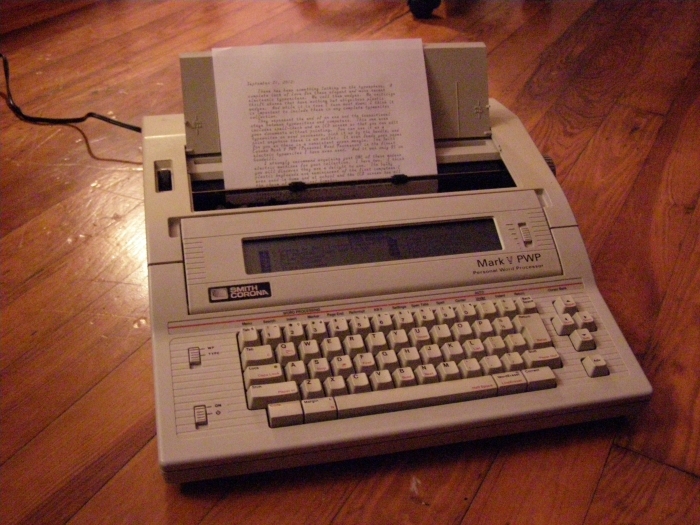 My first typewriter was an early 1980s-era model something-100 daisy-wheel Smith Corona electric, dark gray plastic body, snap-on case and, using carbon ribbon and correction tape cartridges, had a 1-line memory erase feature, but no LCD screen. Actually a great-typing machine, better than most any manual, but then again there's that whole post-apocalypse, beat-the-zombies-over-their-heads-with-heavy-iron aesthetic of manual typers. The closest thing to the electric wedge that I still own and use is a several years-old AlphaSmart Neo. It's like a full-sized computer keyboard (sans the number pad to the right) with a 6-line LCD screen, built-in word processor with enough memory for a 50,000-word screed, powered by 3 AA batteries that last, on average, about 2 years. A USB connector enables you to transfer documents to other devices. A great writing machine, perhaps the best for getting that rough 1st-draft down. 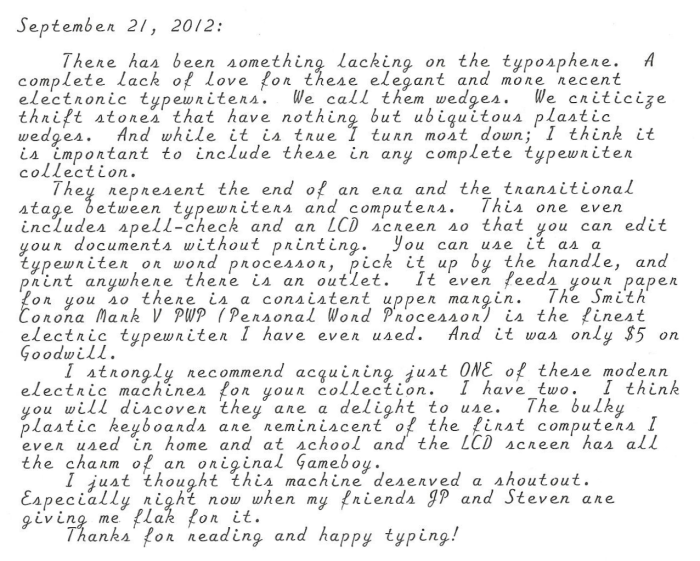 Thanks again for the post, I might have to do a blog article about my AlphaSmart Neo, and perhaps look for an e-wedge in good working order. Don't spend more than $10 on it, in fact, try and spend less than $5, but certainly I think every one of us should have ONE at least. Unless someone really truly hates using them (unlikely) then is $4-6 really a big sacrifice for what is actually a respectable writing machine? I'm glad to see stories about wedges. It's far from my favorite machine, I just think it deserves some credit for being kinda fun and cool to use. I agree that is a lack of love for electrics in the typosphere. Various reasons are given: they won't work after doomsday, their lack of tactile feedback, their inherent noise. If someone didn't love and care for them, a large portion of typewriter history would be lost. I have been thinking more and more about getting an electronic machine. More recently, actually, as I received a letter written on an electronic Brother a week or so ago, and it was delightful! Looked as though it was printed on a laser printer. Of course, I am not actively pursuing one, but if I happen upon a nice one that is cheap enough, I may just grab it up. The typeface of yours is quite nice. I imagine this is a daisy wheel machine? Have any other wheels? It is a daisywhell, and I have at least 5 different wheels for it. Found them in the warehouse at work and bought em cheap. i agree with you - everyone should have at least one of these 'grey wedges'. I have several - and I love them all. I regularly use electronic typewriters for work purposes. One of them holds a database for me to print letters out (the simplicity far outweighs any computer for mailmerging). PS - I find with my script font that setting the pitch at 12 (or 15) makes the cursive lines of the font flow beautifully. You are totally right and I usually do that when typing, but this was word processed and I didn't change the settings for the word processor.